(a friend or family member) so the family need not be involved in any significant way. In a time of loss the impact can be overwhelming and difficult. Those emotionally involved should not have to deal with the cleanup of such incidents. Our services help bring closure and peace of mind as soon as possible during a time when compassionate, respectful action must be taken. 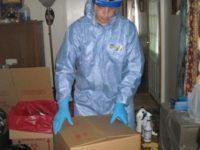 MasterDry deals with the containment, removal and disinfection of biohazards from scenes of homicide, suicide, traumatic injury, or undiscovered death. To ease the burden, you will find that most bio-scene recovery services are covered by homeowners insurance, auto, or business insurance. We will work with law enforcement, property managers, insurance companies and government agencies to provide bio-waste removal and cleanup services. We are here to help those in need 24 hours a day, 7 days a week.